The human brain works associatively and linearly - it compares, combines, rearranges and fuses different elements. As modern literary and linguistic theories have it, the very ideas of learning and remembering is based on comparing, finding differences between and linking words, concepts, ideas to others and thus creating a network of meanings. Visual accents - Use e.g. capital letters, colours, symbols, highlighting, for keywords/topic ..... Mind maps allow you to use your visual memory! Organized information - Good mind maps represent the structure of your memory, which is why people often claim that having drawn a mind map they never had to look at it again. The active creation of the Mind Map successfully helped to organize, re-structure and link all the important pieces of information. Associating of course also helps developing new ideas - that is new combinations which the spark off totally new thoughts as every keyword of a map is like the center of a new map. This makes Mind Maps highly effective for brainstorming (e.g. when collecting ideas for an essay). Start with the basic problem and develop your growing network of associations, ideas and wide variety of possible approaches and solutions. Colours, numbering, a special arrangement on the page etc. may finally help to clarify the most important aspects or the steps that are going to be taken. 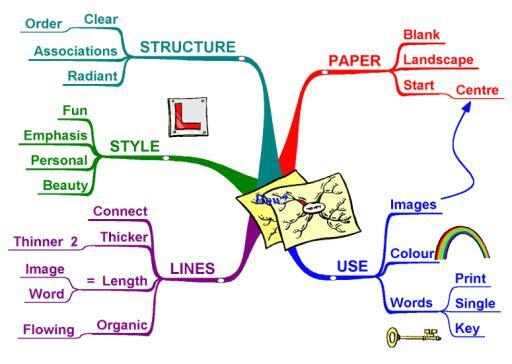 Mind maps allow quick collection, creation, documentation and rearrangement of ideas! Learning and structuring vocabulary - An excellent way of collecting words/phrases you already know and then integrating new ones - all arranged around a central idea. This structures your vocabulary, shows similarities and differences and of course gives each word or phrase a context that helps to memorize an access it. Taking notes - The best thing about this system is that regardless of when a new idea comes up, you can place it in the best place in your structure/hierarchy and link it exactly with what you think should be linked to. This is impossible in linear note taking, which has to follow the chronological order of the talk you are listening to. Text Production - Mind maps can are great for producing new ideas quickly, writing the down, structuring them (colours, numbers ....) . After that writing down your essay is easy. Studying texts - Do not write the usual summaries or abstracts of texts you read - create a map while you read - simply by adding a new idea or branch in the appropriate place whenever you feel you have read something new or important - The effect will be a very short, well structured summary of your text - perhaps even including facts you already new or ideas you had while reading the text. Processing, rearranging and mapping out the most important aspects of the text will surely help you to understand and remember the text. Revision of the text also will usually easy - just look at your mind map. To make sure you really know your text redraw the mind map from memory . Collect everything you already know about the subject in personal mind maps. Draw a group mind map by comparing, sorting and fusing what you already know. Find out what you need to research, learn or study. a) Study/research alone or in teams covering different areas. Each person/team completes one branch of the mind map. Good method to cover a wide field quickly. b) Study alone, with everyone covering all areas. Create a complete individual map. Then the whole group meets again and create the final group mind map. Giving a Talk - Instead of classical memory aids like A5 cards a mind map is very brief (only keywords, no sentences), easily accessible (everything on one page), you are not tempted to (boringly) read out your notes, and you are very flexible, if you have to change the order of your theses and do not have to panic while trying to find the right card or page. A good (and free - if you are a pupil/teacher of the Regiomiontanus-Gymnasium) programme for doing mind maps on a PC can be downloaded from http://www.theli.de/down/mindman.exe. To install it, you need a password, which you need to get from Mr. Thelenberg. The Open Source Programme Freemind is a nice alternative. Completely free and very versatile. Needs up-to-date Java Runtime Environment on your PC. .